I have to celebrate for a minute because today is October 11th and it FINALLY feels like fall in Dallas! If you live in the south, you know what a momentous occasion this is because October is so unpredictable. This proves to be especially tricky when picking out your halloween costume because one year you will be sweating through your giant furry Chewbacca costume, and the next you will freeze, wishing for that costume back- it’s crazy! Regardless of how the rest of the month goes, I am going to take this 58 degree weather and bask in all of its sweater, suede and scarf glory! Fall is my favorite time of year for the holidays, but also for the fashion! I already have a shopping cart full of fun new sweaters, dresses and boots that I am excited to share with you all soon, but I had to break into the season with one of my new favorites, this Leith Ruffle Sleeve Top! 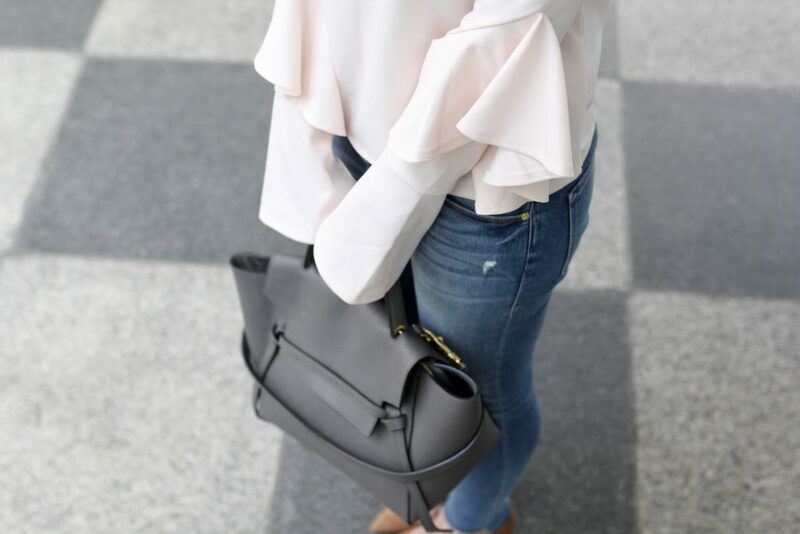 If you have been following me for a while, you know I am all about the sleeve latley and this top has not one, but TWO ruffles- I’m sold! This super cozy top provided the perfect amount of warmth, without going full fall! We all have that one friend that will wear a scar, coat and boots the second it hits below 70 degrees, and if you don’t have that friend, you probably are the friend 😉 Truth be told, I am that friend, so I tried to slow my roll and walk into this fabulous time of year a little slower. I paired this top with my favorite Frame medium wash distressed jeans (ON SALE HERE! ), threw on my trusty brown suede Manolo’s and added a little shimmer with THESE gold tassel earrings (you have probably seen me wearing these in every episode of RHOD, I love them so much) before heading out the door.